A Shoreditch market stall which has been run by the same family since 1919 is celebrating its 100th birthday. Sydney Edward Tothill opened the tea, coffee and snacks stand on Calvert Avenue with his invalidity pension after fighting in the first world war. The mahogany-panelled stall, which resembles a horse-drawn carriage, is thought to be the oldest food shack in London. 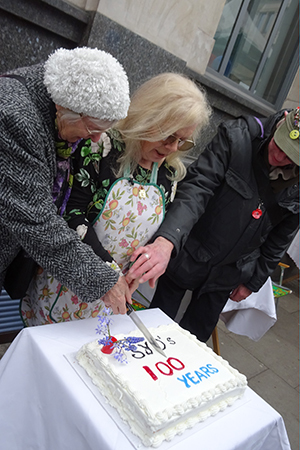 To mark the centenary, Sydney’s granddaughter Jane Tothill, who runs the stall today, was presented with a plaque and flowers by the Hackney Markets team, before cutting into a specially made cake. She said: “I would like to thank all our many customers down the years who have made this possible. “Who would have thought we would have gone on for so long, particularly with all the huge changes round here? 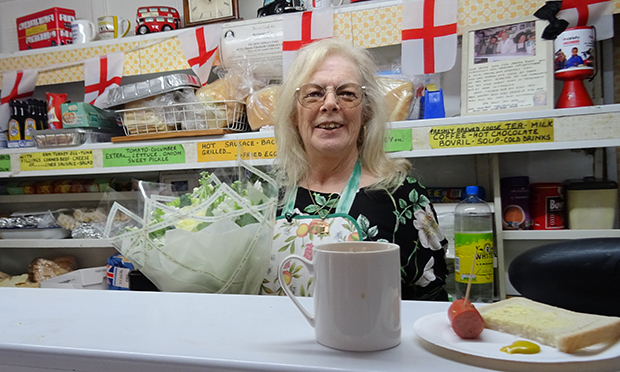 She says in the early days, you would often hear people clamouring for “a sav’ and a slice at Syd’s”, made with saveloy sausages supplied by a German butcher in Hoxton, but now it offers tea, coffee and ham and bacon sandwiches. After the second world war, the business expanded into catering for weddings and events. The spin-off was named Hillary Caterers – a tribute to Sir Edmund Hillary, the first man to conquer Everest. Cllr Ian Rathbone, the borough’s markets champion, said: “This is a fine example of a family-run business which has lasted the course – a model to those thinking of starting out in business.